Nobody wants to have the NICU as a part of their new-baby journey, am I right? Nobody. Especially when you're so eager to introduce your older child(ren) to their new baby brother or sister. If I know preemie parents, I know y'all often feel guilty and unsure of how best to care for your older kids while spending the important bonding time with your newest, most vulnerable little one. Fear not because here are plenty of tricks and ideas you can try to make the transition smoother and more fun. Today I want to focus on some fun ways to keep your older kids feeling included, appreciated and loved through the experience. I am a huge fan of talking with kids, openly and honestly, no matter their age. I think it helps build a lifetime of trust and understanding. So the first step towards helping your older child handle this situation well is to do your best to explain the situation, regardless of their age. Truth, at an age-appropriate level, is always the best way. For more advice on talking with siblings about preemies in the NICU, read more at CHOC Children's Blog and Siblings and the NICU from the March of Dimes. I am also a huge fan of books. For older siblings, books about preemies are really valuable because they normalize prematurity. Reading about other preemies in real books shows that this is just another normal life experience and it doesn't have to be scary or strange. It's a great way to get in some quality time together while opening up the doors to communication about what's going on. 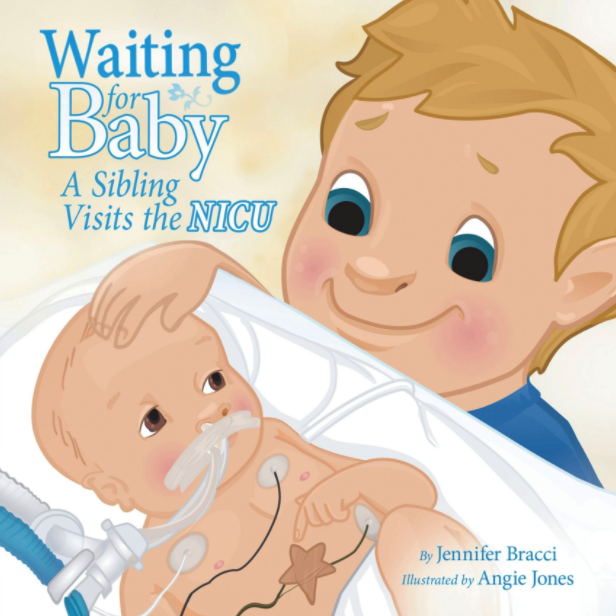 Waiting for Baby - A Sibling Visits the NICU by Jennifer Bracci. This is great to get right away and read with your older child in preparation for visiting the NICU. Perfect for those siblings of micro-preemies who aren't visiting right away, so you have time to buy and read the book together. My Sister / Brother is a Preemie by Joseph Vitterito. A sweet little book that's empowering and positive. Peanut - a Storybook for Mighty Preemie Babies by Lindsay Nolan. Simple and beautiful, it's ideal for younger kids. This book will give siblings a glimpse into what life is like from their new baby's perspective. 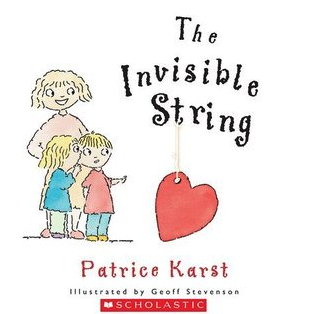 The Invisible String by Patrice Karst. Great for reinforcing your love for your older child, even when you are apart. The Kissing Hand by Audrey Penn and Heather Koren. This as a beautiful best-selling children's book that helps little ones cope with separation issues. It can be a wonderful tool to help parents and older siblings bond and have a special activity for those times when they're apart. The Very Tiny Baby by Sylvie Kantorovitz. This one isn't for everyone, although it can be perfect for many siblings. This chlidren's book gives a voice to the older child who is confused and frustrated about everyone in the family being super pre-occupied with the new baby. And it gives a voice to the older child who is angry about the attention and the worry that the new baby has brought. It's honest, to the point that the sibling is so mad he says he wishes the baby would die. That may seem harsh, but it's also very real that young children have intense emotions like that. I think this book is a great tool for opening up conversation and allowing an young child to express their own deep feelings. Go Preemies by AP Male. This book is so perfect for siblings, because it's not really all about the NICU, it's all about how awesome preemies are. Gives an older sibling an opportunity to feel proud and excited about how brilliant their unique brother or sister is! Your NICU should be able to connect you with a social worker, and your social worker is the perfect person to ask about support groups. Many support groups have gatherings for siblings, and they are a great way for young children to feel included in the world of the hospital which is the center of their parent's life. Your social worker may also be able to connect you with a Child Life Specialist who is trained in helping children cope with the challenges of hospitalization, illness, and disability. These professionals often work with pediatric patients, and sometimes they will meet with NICU siblings for some therapeutic play time. They are incredible at speaking to kids about stressful hospital situations in a way that helps them feel heard & understood. If it's available at your hospital, by all means give it a try! Don't know if your hospital offers it? Ask! Another strategy is to try to find another preemie parent who had older kids at home to be your peer mentor. It really helps to talk with someone else who actually understands your struggle. If you can find a mentor locally, that's great because they're most likely to know the ins and outs of your particular NICU and your community. But if you don't have access to a local preemie parent mentor, consider reaching out to Hand to Hold or NICU Helping Hands who match NICU parents with peer mentors. And be sure to ask for a mentor who had other kids at home so you can pick their brain for even more ideas about your struggles. Older siblings want and need to bond with the newest member of the family too, and the NICU doesn't have to ruin that. There are plenty of ways that kids can begin to connect. Video Chat - Parents often take pictures and even videos of the baby in the NICU, but you can even go one step further and use Skype or Face Time to have some time with both of your children. Just work with the nurses to find a good time where it won't be too disruptive to your baby or the other families nearby. Writing a letter - Kids of all ages can write letters to the new baby. Whether it's a quick "I love you!" note to tape to the bedside or a full-page story about all the wonderful adventures the two will have when the new baby comes home, it's a great opportunity for your older child to write and to begin their conversatoin with their new buddy. A gift from the baby - Very young children are usually thrilled at the idea that their new baby brother or sister has a gift for them! (Did you see Jimmy Kimmel explaining is his hilarious way about his new baby "giving" his 2 year old daughter a gift? LOL! You can see it here -it's at 4:46 in the video) So find a toy that you know your older child will love and deliver it as a gift from your new preemie. A gift for the baby - it's better to give than to receive, right? Siblings of any age enjoy choosing something special that they want to give to their new baby brother or sister. Be sure to buy something that the nurses say will be okay to use right away. If your older child can't be there to deliver the gift in person, be sure to take pictures of the gift with the baby so your older child can see the gift with the baby and feel more connected. Record their voice for the baby - You can help a young child feel super important in caring for the new baby if you have them read books, tell stories, or just say hello on a voice recording. Most smart phones these days have a voice recorder, so figure out what you think your older child would like to say and record it. Or find a book like this that allows a voice to be recorded, and you older child can read to the baby. Then be sure to tell the sibling all about how much the baby loved hearing his or her voice! I love 'em - glue, glitter, making a big ol' mess! Why not use craft time as an opportunity to make things for the new baby? Onesies - This tip comes from the fantastic preemie mom Jennifer Degl and her blog From Hope to Joy. 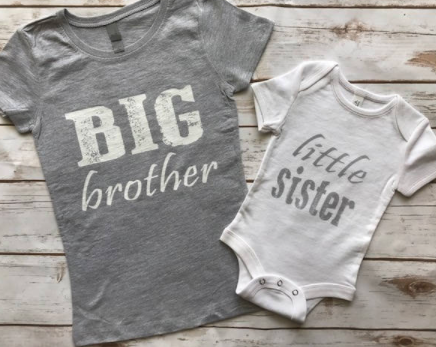 Matching older sibling + new baby T-shirts are the cutest! Just because a baby is a preemie in the NICU shouldn't stop them from celebrating their sibling pride. Click on the photos above to visit the cutest Etsy stores where you'll find tons of sweet sibling combos. 1. Most children get very bored in the NICU environment, so it's best to expect a short visit. 2. Siblings can feel very important if they have a job to do, so you might have a special book they can read to the baby, or even a song to sing for the baby. To help you little one know what to expect while visiting, show him or her this cute video. Watch together and then talk about what it's like at YOUR NICU. Remember to tell your kids you love them. Your hugs and your "I love you's" are honestly some of the most important things in their lives. And they don't take much time at all. It's okay if you feel like you don't have enough time for everyone - it's very likely that you don't. It's okay if you feel like you aren't able to be the best parent in the world right now - who could? Nobody expects you to know how to make this work - having a preemie in the NICU is a big deal, it's a crisis for the family and it's okay if it feels like one. Be kind with yourself, be compassionate towards yourself, and then go do the best you can. All of your kids will love you for doing the best that you can. As always, if you're feeling utterly overwhelmed and you might need someone to talk with about how you're feeling, that's perfectly normal too. You might reach out to Postpartum Support International or the Postpartum Stress Center for starters. The Best Mother's Day Gifts for Preemie Moms, According to Preemie Moms!